At the ASC Conference, 15 November 2018, London, we gave a presentation reviewing the sort of Artificial Intelligence being used in 2018 in the field of market research. This presentation was based on a survey, interviews with industry leaders, desk research and our own experience. We have now written a report based on the research we conducted and you can download it by clicking here. 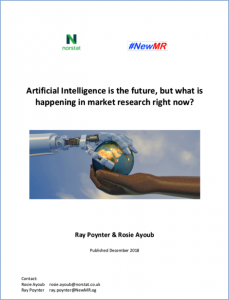 AI (Artificial Intelligence) is indeed in widespread use in market research, and that use is likely to expand rapidly. However, the term artificial intelligence is the source of considerable disagreement, there is wide variation about which approaches are described as AI or not. Since AI cannot be defined clearly in terms of what it is (partly because intelligence itself has not been clearly defined), definitions tend to be based on whether a system appears to be ‘intelligent’ or ‘clever’. Key examples of market research techniques that represent approaches that are widely accepted to be artificial intelligence include: Chatbots, Automated Facial Coding, Automated Sentiment Analysis, Automated Transcription of Video, and Text Analytic Software. Outside of the world of market research the two most widely selected examples of artificial intelligence were Siri and Alexa, with about two-thirds saying they were examples of AI. This is a similar number to those who said Chatbots in market research are examples of AI. However, even with these two examples, one-third of participants indicated that they did not class Siri and/or Alexa as AI. A key distinction when reviewing artificial intelligence is to determine whether it is ‘doing AI’ or ‘using AI’. ‘Doing AI’ refers to utilising an approach such as unsupervised machine learning to solve a specific problem. ‘Using AI’ refers to creating a system via AI that can then be applied to a range of problems (in the way that Google Translate can be used to translate text) – when the tool is developed we are ‘doing AI’, when the tool is applied we are ‘using AI’. If a technique could fairly be described as artificial intelligence by some people, it should probably be described as AI by users and vendors of that technique. Being overly narrow about definitions of what is and isn’t AI could hold back the rapid adoption of new, innovative, and cost-effective solutions.